This is a real ghost story, but like all real ghost stories, you don't get to see the ghost. Hey, you boy there! What did I just tell you? Please don't attempt to look at him straight on, son. The harder you try, folks, the more he fades, and he's just barely with us as it is now. You'll have better luck looking away. Pretend you don't see him, and maybe you'll catch a sidelong glimpse from the corner of your eye. Wait quietly and you'll soon feel his presence in unexpected places. His influence, from the unexplained creak on the stair, the glass mysteriously falling from the table, music and voices coming from a empty downstairs room. Is that Lovesick Blues? No, maybe it's Bob Wills. Or maybe I'm totally wrong, and it's really Jimmie Rodgers. It's so faint, so hard to hear. It's like a ghost singing. This is a story about a ghost who made music, a ghost named Emmett Miller, a forgotten son of a embarrassing and often deliberately forgotten American art form, the blackface minstrel show. 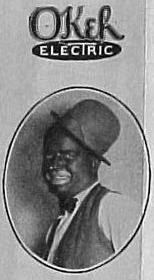 Born in Macon, Georgia on February 2, 1900, Miller's family later said he had wanted to become a minstrel show comedian almost from the time he spoke his first word. And he achieved that goal by the time he and the new century had reached their mid-20s. While the early part of Miller's life is still a mystery between 1919 - when he left home to pursue his dream - and 1924, he had built up his career enough that an August, 1924 issue of Billboard noted that he had played a three-day engagement with the Dan Fitch Minstrels in Poughkeepsie, NY. Becoming a successful blackface comedian in 1924 must have been a little bit like finally attaining a lifelong dream to become a horse collar maker. While there was still work for both professions if you tried hard enough to find it, your day was done before you had even gotten started. Our ghost would have probably disappeared unknown, unloved, and unmourned except that Emmett Miller also made his first recordings in the late fall of the that year, 1924, for the Okeh label. The recordings included Any Time, his signature song on stage. 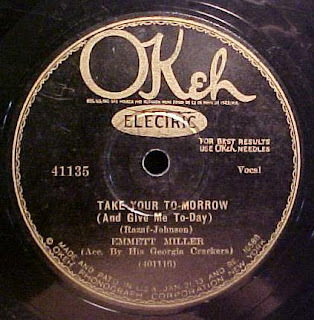 By any measurement and in any time, Miller's Any Time is one strange song, beginning with what sounds like a cry of pain after a straightforward jazz introduction and then Miller's blackface partner incongruously noting, "Emmett, you're looking mighty happy today." 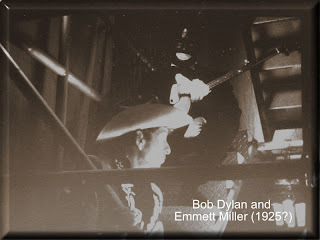 But Emmett doesn't sound happy at all, as he begins Any Time with a stereotypical minstrel routine, and then moves into the actual song, which in his hands - or maybe more accurately, his voice - becomes a witches brew of exaggerated blackface vocalization, jazz phrasing, and country yodeling. Yodeling. But not the yodel-lay-hee Sound of Music Lonely Goatherd style of yodeling. Miller's yodel sounds more as if the lyrics were suddenly disappeared. As if become exhausted, the singer is now without recourse to words, and what bursts out is this awful, inarticulate cry, until Miller seemingly recovers himself and remembers that there is a next line. Small wonder that Miller became known as the man with the "trick" or "clarinet" voice. "Without a doubt my father learned Lovesick Blues somehow from Emmett Miller. It was either by record or he heard him perform it in person at a minstrel show." - Hank Williams Jr. The version we heard of Any Time was cut in the fall of 1928, with Miller backed by a band dubbed the Georgia Crackers and which included both Tommy Dorsey and his brother Jimmy, as well as drummer Gene Krupa. 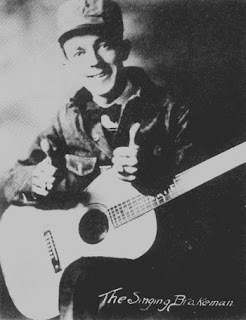 In an earlier session, Miller and the boys also did a remake of his Lovesick Blues, which he had first recorded in 1925, and would eventually become the foundation for Hank Williams' 1949 hit. As Hank Williams Jr. noted, maybe his father learned Lovesick Blues directly from Miller - at least one person remembers Hank praising Miller's version of the song - or maybe it was from one of the cuts Miller put on record. In either case, when Williams recorded his version, it was obviously influenced by Miller's vocal style. Lovesick Blues was written by Irving Mills and Cliff Friend in 1922. Incidentally, Friend's best-known song is probably 1937's The Merry-Go-Round Broke Down, which became the signature song for the classic Looney Tunes cartoons. Lovesick Blues had been recorded by several artists before Miller picked it up, but it's his take on the song in 19 and 25 that put it on the musical map and would eventually catch Hank Williams attention. We can't let our ghost rest in peace until we take a look at the Emmett Miller/Jimmie Rodgers connection. It's known that during 19 and 25, Rodgers "put on the cork," as the minstrel show saying had it, and was working as a blackface performer. He wasn't alone. 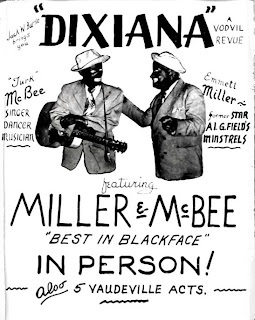 As well as Jimmie Rodgers, Bob Wills, Roy Acuff, and Clarence Ashley all appeared in blackface during the course of their careers. But what's less certain is whether Rodgers ever ran into Emmett Miller and heard Miller's unique yodel. 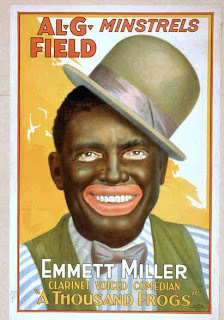 Miller was in Asheville, North Carolina in the summer of 1925, and while Rodgers didn’t move to Asheville until 1927, the city was one of the premiere stops on the minstrel show circuit. So it's possible Rodgers at least passed through town while Miller was in residence and caught one of his performances. And two years later there's some circumstantial evidence that the two may have even performed together. Ultimately, like all good ghost stories, it remains a mystery whether Emmett Miller and Jimmie Rodgers ever met, and whether Rodgers Blue Yodels evolved from Miller's yodeling style. Oscar Vogel: Hello Jack. Do you know me? Jack Fate: You look familiar. OV: I was the star of the show here. One of the biggest stars. I was one of your father's favorite performers once. Everything was going great... just as long as you kept your mouth shut. But he was doing things that were wrong, your father. His desire for retaliation and revenge was too strong. I was the only one in any position to say anything, everybody else was too scared. I had the show, I had a forum. So, I spoke out. It's not what goes in the mouth. It's what comes out that counts. OV: They said it was an accident (strums banjo). Some even said it was a suicide. Some people choose to die in all kinds of ways. Some people jump out of buildings and slit their wrists on the way down. Some fall on their own swords. I opened my mouth. You remember? My name is Oscar Vogel. JF: Well, I gotta get back to the stage. By the end of the decade popular interest in minstrel shows had all but faded away although, like an inconvenient ghost, the cork kept re-appearing on stage and in film. Well into the next decade, Mickey Rooney and Judy Garland would appear in blackface in 1939's Babes in Arms. Bing Crosby appeared in blackface in 1942's Holiday Inn, the precursor to the better-known White Christmas, released in 1954, and which also included a minstrel show number, but which, happily, was not done in blackface. The Black and White Minstrel Show was a popular British television series with a 20-year run into the `70s that presented traditional American "Deep South" songs - usually performed in blackface. But even though it kept rolling in the grave well into the 1950s, the minstrel show was certifiably dead by the early `30s, with the popularity of movies putting the final nails in its - and its descendant, vaudeville - coffins. Interestingly, many of the minstrel show performers just put on a new mask - one that didn't require the cork - and moved into "hillbilly" music, masquerading this time as folksy hicks, rather than as rural blacks. In time, many of the pseudo-hillbillies and cowboys like Jimmie Rodgers and Bob Wills would in turn make the move into the more sophisticated country-western genre. But what of our ghost, Emmett Miller? As far as the record shows, Miller apparently stuck to the cork to the bitter end. During the last part of his recording career, he tried to tame down his vocal style in an attempt to imitate then popular crooners like Rudy Vallee. But it didn't take, possibly because Miller kept including dated blackface routines with his music. His final recording sessions were in 1936. But he never stopped working until the work dried up, performing when and where he could in minstrel revivals, vaudeville, even appearing with Scatman Crothers in a 1951 movie, Yes Sir, Mr. Bones. But that was the last gasp for the cork and for Emmet Miller. He'd return to the town where he was born and die in Macon, Georgia in 1962. 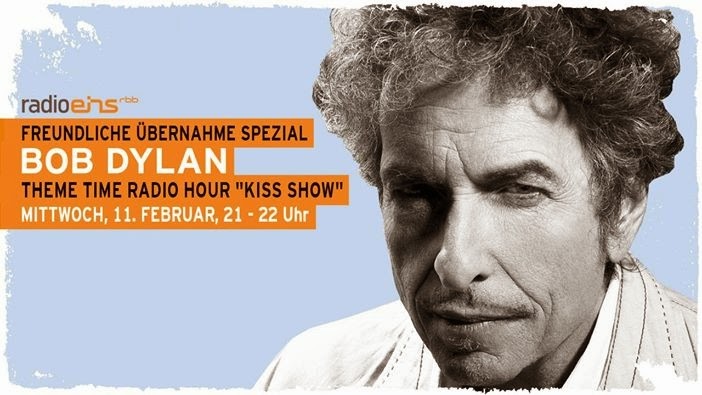 Bob Dylan's thoughts on minstrel shows and blackface are unknown. But given the fact that he named an album after a book about the history of minstrel shows, it's pretty obvious that he does have some thoughts on the subject. And then there's Masked and Anonymous, of course. In the movie, Dylan - as the character Jack Fate - receives a visitation from his predecessor, a blackface minstrel. "Do you know me?" he asks. "You look familiar," Dylan replies. The minstrel man later claims his name is "Oscar Vogel." But I'm not so sure. I think he may have worked under more than one name. He was once the star of the show here. More Reading and Listening: The Wikipedia article on Emmett Miller; The Red Hot Jazz site, which has an excellent collection of Emmett Miller songs in RealAudio format; There's also a good overview of Miller, and his importance to country music, written by an an AnnMarie Harrington in 2003 at the appropriately named "Take Country Back" site. Much of Harrington's article appears to be sourced from the touchstone of all Emmett Miller arcana, Nick Tosches' 2001 book Where Dead Voices Gather. Alternately fascinating and maddening, the book is no easy read. 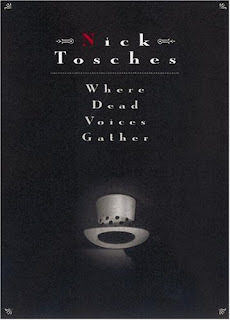 Tosches' prose can become so dense as to be impenetrable and much of Where Dead Voices Gather seems to have been written as stream-of-consciousness. When Tosches runs out of things to say about Miller, which happens quite often, he falls back on interminable lists of recording dates, forgotten songs, and minstrel show bookings until something new apparently occurs to him. The digressions can range from slang terms for female genitalia to whether Dixie was Abraham Lincoln's favorite song. And we're off and running with Nick again. Tosches also isn't particularly well-liked in the small but active Emmett Millerphile community, where he's been criticized for sloppy - or no - research. Even I caught him out in a mistake while reading Where Dead Voices Gather. Tosches claims Wanda Jackson recorded the same Right or Wrong as Miller, but just a listen to a few seconds of either piece of music shows that they're completely different songs that happen to share the same title. Having said all that, I still commend Where Dead Voices Gather to your attention. As frustrating as the book can be, it's still on a par with Greil Marcus' The Old Weird America as a document of Americana music. Finally, our ghost in blackface is alive and well in the digital age, 107 years after his birth. Dreamtime is researched and written by Fred Bals and is a Not Associated With production. As the name says, we're not associated with XM Radio, Bob Dylan, or much of anything else. Some of the music on Dreamtime is provided via the Podsafe Music Network. Check it out at music.podshow.com. The closing segment's music was an excerpt from Ol' Time Banjo, by David Miles Huber. Theme Time Season 2 Begins September 19th!